A disciplinary report was received from the 1st XI match between Ainsdale v Formby on 26th August. Ainsdale CC has banned Malcolm Swift for TWO WEEKS commencing at midnight on Friday 1st September until midnight on Friday 15th September with a further TWO WEEKS suspended until the end of the 2019 season. The offence was dissent and abusive remarks to an umpire. A disciplinary report was received from the 1st XI match Parkfield Liscard v Maghull on 26th August. Parkfield Liscard CC has banned Barry White for TWO WEEKS commencing at midnight on Friday 1st September until midnight on Friday 15th September. A further ONE WEEK ban is suspended until the end of the 2018 season. The player's offence was dissent and the use of abusive language. A disciplinary report was received from the 2nd XI match Liverpool v Ainsdale on 19th August. Liverpool CC has banned Nicholas Donnell for ONE WEEK for abusive behaviour towards an umpire with A FURTHER WEEK suspended until the end of the 2018 season. The ban commenced at midnight on Friday 25th August until midnight on Friday 1st September. Regrettably such abuse of an umpire provided by the opposing team is becoming more of a common occurrence and all clubs need to realise that the Disciplinary Committee will not tolerate this behaviour. All these officials do their very best in difficult situations to provide impartial decisions and must be respected by the players and especially the captains for the service they provide. A disciplinary report was received from the 1st XI match between Fleetwood Hesketh and Wigan on Saturday 12th August. Fleetwood Hesketh CC has banned Daniel Murphy for ONE WEEK commencing at midnight on Friday 18th August until Friday 25th August with a FURTHER WEEK suspended until the end of the 2018 season. The offence of equipment abuse is still under consideration by the Disciplinary Committee and the length of ban may be increased. A disciplinary report was received from the 2nd XI match between Old Xaverians and Wavertree on 5th August. Old Xaverains CC has banned its player Ian Deakin for TWO WEEKS for abuse of an umpire. The ban will commence at midnight on Friday 11th August until midnight on Friday 25th August and a further TWO WEEKS ban is suspended until the end of the 2018 season. A disciplinary report was received from the 1st XI match St Helens Town v Northop Hall on 29th July 2017. St Helens Town CC has banned its player Joshua Davies for THREE WEEKS commencing at midnight on Friday 4th August until midnight on Friday 25th August with a further THREE WEEKS suspended until the end of the 2018 season. The offence was (i) dissent at an umpire's decision by action and verbally, and (ii) verbal abuse of opposition players and scoring official. A captain has been banned for ONE WEEK for failing to follow the ECB Fast Bowling Directives. Newton le Willows CC's 2nd XI captain, Ian Walkden, is to receive a ONE WEEK ban commencing at midnight on Friday 28th July until midnight on Friday 4th August and an additional one week ban suspended until the end of season 2018. The team card for the 2nd XI match Newton le Willows v Highfield on Saturday 8th July 2017 did not mark an age group player as being Under 19 and the bowler breached the ECB Fast Bowling Directives. In accordance with section 6.2.4 of the 2017 Playing Regulations, Newton le Willows 2nd XI will also be deducted the 9 points gained and the club fined �75.00. The match was awarded to Highfield. a deduction of all points gained, plus a fine of �75.00 and any further penalties imposed as the Management Committee considers necessary in the circumstances and for which there will be the opportunity for appeal by the club. Age groups are defined by the player's age at midnight on 31st August in the year prior to the relevant season. A disciplinary report was received from the 1st XI match between Leigh and Formby on Saturday 22nd July 2017. Leigh CC has banned its 1st XI captain Matthew McKiernan for ONE WEEK commencing at midnight on Friday 28th July until midnight on Friday 4th August and a further two weeks ban will be suspended until the end of the 2018 season. The player was guilty of verbal dissent as the umpires left the field of play at the end of the match. A disciplinary report was received from the 1st XI match between Maghull and Liverpool on Saturday 22nd July 2017. Maghull CC has banned the player Paul McKenna for ONE WEEK commencing at midnight on Friday 28th July until midnight on Friday 4th July with a further one week suspended until the end of the 2018 season. The player used abusive language to an opposition player. A disciplinary report was received from the 1st XI match Ormskirk v Formby on Saturday 8th July. The Formby player, James Seward, has been banned for THREE WEEKS commencing at midnight on Friday 14th July until midnight on Friday 4th August with a further THREE WEEKS suspended until the end of the 2018 season. His offences included dissent, using abusive language to the umpires and damaging the dressing room door. He will miss matches (h) New Brighton, (a) Leigh and (h) Bootle. A club player, official and qualified umpire has been banned for sending an obscene and offensive e-mail to the L&DCC Management Committee. 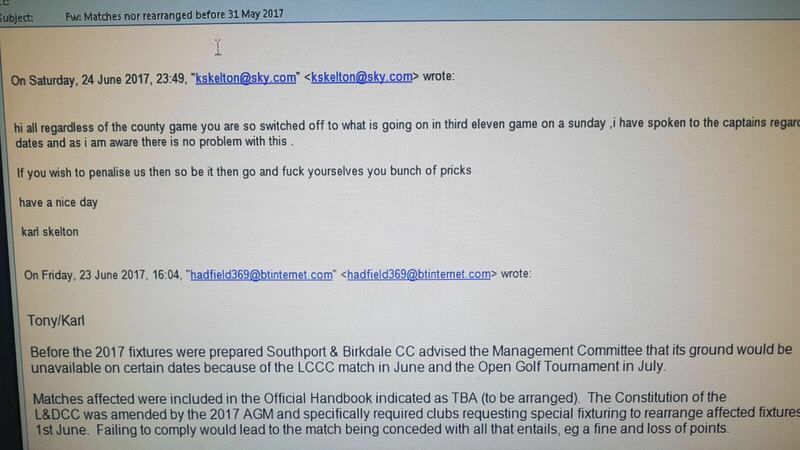 Karl Skelton of Southport and Birkdale CC objected to decisions made by the Cricket Committee regarding several failures to follow procedures laid down in the Playing Regulations for matches to be rearranged because of ground unavailability. His e-mail of 24th June to the Management Committee was grossly offensive and wholly inexcusable. This offence is not directly included in the L&DCC Disciplinary Regulations and falls to be dealt with by the Chairman of the Disciplinary Committee under Clause 1.8. The Chairman, Richard McCullagh, has imposed an immediate SIX WEEK ban from playing, organising, officiating or participating in any cricket with a further SIX WEEKS suspended until the end of the 2018 season. A disciplinary report was received from the 2nd XI match between Wallasey and Leigh on Saturday 4th June. Wallasey CC has banned the player Stephen Potter for TWO WEEKS plus a further TWO WEEKS suspended until the end of the 2018 season for inappropriate physical contact with a Leigh batsman. A disciplinary report was received from the 1st XI match between Fleetwood Hesketh and Newton le Willows on Saturday 20th May. Newton le Willows CC banned the player Christopher Chambers for dissent by action and verbally for ONE WEEK. The ban commenced at midnight on Friday 26th May 2017 and finishes on Friday 2nd June. The L&DCC Disciplinary Committee agreed with the club that a further three weeks ban suspended to the end of the 2017 season should also be imposed. A disciplinary report has been received from the 1st XI match between Northop Hall and St Helens Town on Saturday May 13th. Two players from the St Helens Town team were reported, Craig Woods and the captain, James Davies. With agreement of the Disciplinary Committee, St Helens Town has banned the player Craig Woods for THREE WEEKS all of which has been suspended to the end of the 2017 season for dissent by action and verbally. The umpires advised the club that their captain would be reported and so although the report receipt was delayed by 48 hours, James Davies' ban commenced at midnight on Friday May 19th (until midnight on Friday June 2nd). His offence was more serious dissent by action and verbally and, as captain, the full tariff of SIX WEEKS is considered appropriate with FOUR of these weeks suspended until the end of the 2017 season. A disciplinary report has been received from the 2nd XI match between St Helens Town and Wavertree on Saturday May 13th. St Helens Town CC has banned the player Ian Jenions for TWO WEEKS with a further TWO WEEKS suspended until the end of the 2017 season for dissent using obscene language. The ban will commence at midnight on Friday May 19th and end at midnight on Friday June 2nd. Southport Trinity CC has banned the player, Joseph Damen, for TWO WEEKS. The ban commenced at midnight on Friday May 12th and will end at midnight on Friday May 26th. The player was reported for abuse of an umpire using obscene language and a further TWO WEEKS ban has been imposed, suspended until the end of the 2017 season.